$200 solves this issue for most small businesses with under 50 employees, if their independent agent has offered coverage through Big "I" Markets' "Cyber Liability-Small Business Solution" product. Merchants of all kinds should carry cyber coverage. Lawyers, CPAs, podiatrists, consultants, counselors, taxi operators, restaurants and bars...you name it. You'll find our ineligible list is tiny: banks, cloud computing, gambling and adult entertainment. At a minimum, email every small business in your client roster to offer coverage. We've done the work for you and provided a concise sample letter. You’ll find it located under “Product Resources” on the Cyber Liability-Small Business Solution page in Big “I” Markets. This letter outlines the product features and you can add some of these claims examples to the email. Even better, mail the letter through USPS, or use it as a reason to check in with a call or personal visit...or combine them. Coverage is "primary to other." If your client asks for more coverage, offer consultation after providing instant protection. You also have access to industry leader Travelers Wrap through Big "I" Markets if higher limits are desired. A brief How-To Quote Cyber Liability video is also available on the Big "I" Markets web site. The Big "I" national Young Agents are encouraging agents to give back to the community the week of June 1-8. Join the committee and the Illinois YAC, inspiration for the event, to learn how you can easily be part of the GIVE movement, a week long campaign dedicated to giving back to the community. Join us April 13 at 12 noon ET and help us celebrate ordinary people doing extraordinary things! We'll share ideas and launch our Make-A-Wish national fundraiser! To learn more about the GIVE Movement, visit the GIVE Movement website. On April 1, 1998, Goldleaf Financial, Ltd. began operations in Montevideo, MN. And while the company has undergone many changes throughout the past 20 years, one thing has remained consistent - our reputation as the most comprehensive surety services company in the US. When other surety bond specialists or companies are restricted by size, specialty divisions, or other constraints that limit the entire bonding process, Goldleaf has continually brought it all together under one roof. Our highly experienced staff and refined practices often allow us to assist companies in obtaining surety support where others have said no. Our surety specialists create surety bond results for all types of companies and specific bonding requirements. And we are experts at providing consultation on what changes can be made now and into the future that will have a direct impact on a company's surety program. 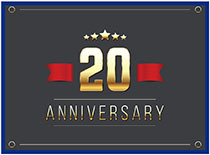 We realize that it is our relationships with you - our agents, contractors and surety partners - that have made the past 20 years so successful and for that, we would like to thank you! We are looking forward to continuing our relationships for many years to come. For more information on bonds - or for help with your clients bonds needs - log in to www.bigmarkets.com or email us at bigimarkets@iiaba.net and an underwriter will contact you. April 12 - Is All Business Good Business? I'll save you the suspense - NO! Not all business is good business and not all opportunities are good opportunities. There are specific signs to indicate when you should just walk away. That's what we discuss in this session - when to know you need to walk away. April 16 - How Much "Effective" Selling Time do You Actually Have? April 24 - How Much New Business Do You Have to Add to Make Goal? I believe the answer to this question is going to surprise you. For an agency or even a producer to accomplish a new business goal several factors must be considered: 1) retention ratio; 2) "intrinsic" book changes; 3) closing ratio; and 4) average income. When looking for quick strikes of information on focused topics the VU's monthly Lightning Learning series is there to help. The next extended webinar will focus on ISO Personal Auto Changes and includes a 'seat' to attend live, a link to the on-demand recording, and a written transcript. Consider presenting conference style for the entire agency to benefit. Please send any questions to VU staff. Caliper article - "How to Hire the Salespeople of Today and Tomorrow"
Congratulations to our agent in Congratulations to our agent in New York on a Commercial Lessors Risk sale of $9,052 in premium!